FERRY GOOD: Fast boat Geelong Flyer is set to join its sister vessel Bellarine Express (pictured) on the bay following the announcement of a regular Geelong-Melbourne service. A regular ferry from Geelong to Melbourne will launch early December, the operator behind the service has revealed. Port Philip Ferries owner Paul Little on Friday announced a new, purpose-built fast ferry for the twice-daily service, which would dock adjacent to Cunningham Pier before sailing to Docklands. “Since our successful trials last year, we have been working closely with the team at Incat to build a new ferry that will delight the expectations of our passengers,” he said. The ferry has a top speed of 30 knots (about 56km/h). The 400-seat catamaran would feature an on-board café, bike racks, charging stations and free Wi-Fi, Mr Little said. The decision demonstrated Port Phillip Ferries’ confidence in the route, Mr Little told an annual chairmans’ luncheon with Tourism Greater Geelong and the Bellarine. 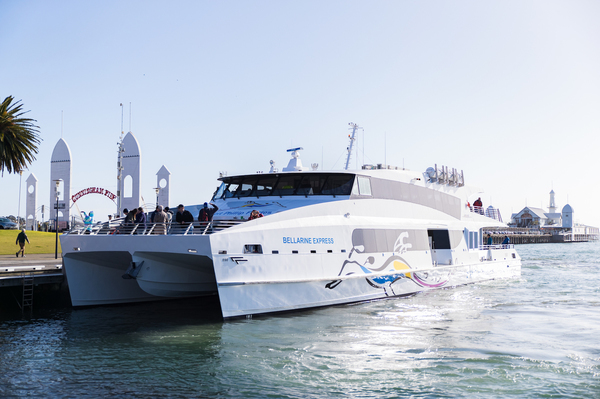 Port Phillip Ferries had been working closely with Tasmanian-based manufacturer Incat to deliver Geelong Flyer, a purpose-built ferry for the service, he said. The new fast ferry was due for delivery prior to Christmas, which ensured it would be in the market for the summer peak season, Mr Little said. “Port Phillip Ferries are excited by and are looking forward to launching the Geelong Flyer in late 2019. Incat also built the company’s existing ferry, Bellarine Express, which travels twice daily from Portarlington to Docklands. The Portarlington service had seen continuous growth in numbers since launching in November 2016 and the new service would expand on its success, Mr Little said. “We continue to witness the population growth both in Geelong and the wider Geelong region, as people and businesses choose to move to regional areas. Port Phillip Ferries was also working closely with Geelong’s council to form convenient land side access to the ferry and reliable connections to the wider region, he said.